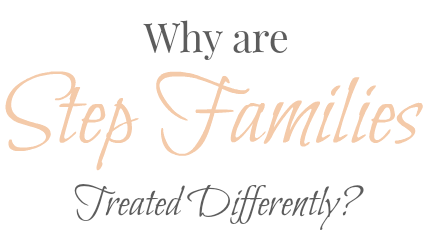 Since becoming both a mum and step mum, I've really taken notice to how the world treats step families differently. Now, this post isn't aimed at any person in particular, but more toward society in general. I feel that even in 2015, where approximately 35% of children in the UK do not live with both parents, step families are not considered 'the norm'. It's sad really, to think that in this day and age there is still such a stigma about being part of a 'blended' family. I've been a step mum for over 5 years (2 and a half 'on paper') and although as a family we feel completely normal, society looks at us very differently. I remember being pregnant with Aria and people asking 'oh is this your first' and Tom and I having to explain that yes, technically this is our first, but we also have Maya, who is just as much both our daughter. Which makes the 'first time mum' label a little difficult to wear. Yes, I am a first time mum, but I'm not really. I'm helping to raise another child, the only difference is I didn't give birth to her. Do you know how hard it is to find a 'step' card? On Mother's Day, Maya always makes such a huge effort to find me the perfect step mum card, which honestly makes me feel so incredibly special, but I know how hard these are to find. Nowadays, there's a card for just about everything... except step families. It's a label I feel like I constantly need to justify, explain or defend. But to be honest, I think that says more about the individual I am speaking to than myself. There are some people who just don't seem to fully accept my role as a step parent. They may pass by the subject, or not acknowledge it whatsoever, which at times can hurt. But it makes me so thankful to have those in my life that accept it for exactly what it is... My family. I could honestly write for days about how I feel about this, as it's something that affects us constantly. But in fear of digging too deep or causing offence, I do have to limit my words. I do just want to thank those people that recognise step families, and treat everyone as equals. It feels like a constant fight and justification of being a step parent, but there are those special close people that make us feel 'normal', so I want to thank you. Are you a step parent? Do you ever feel like things can be a bit more difficult?